As far as overheated markets go, Vancouver’s is without equal in Canada. The average sale price for a detached house in the city proper stood at $2.2 million in September 2015; in the city of Toronto, by comparison, the equivalent number was $1.05 million while in Calgary it was $523,434. And nowhere has the action been more intense than on Vancouver’s west side, where the median sales price was pushing $2.87 million by September 2015 and where most of what might be considered “luxury” homes — those selling for over $4 million — were sold. In the first six months of this year, 206 houses in Vancouver sold for more than $4 million and 722 for between $2 million and $4 million. In Toronto, by contrast — a market three times as big as Vancouver’s — only 70 homes sold for more than $4 million and 790 for between $2 million and $4 million over the same time period. To better understand what is driving Vancouver’s luxury market, BCBusinessdove deep into a number of transactions on one westside street: Angus Drive. We looked at a random sample of 40 of the 52 homes that sold between 2012 and 2014 on the north-south street bisecting Shaughnessy and Kerrisdale, and spoke to seven realtors and a variety of real estate experts to understand what’s moving the market to unprecedented heights. What do we mean by heights? In one case, a house that sold for $2.1 million in 2009 sold again for $6.95 million in 2013. A property that went for $2.9 million in 2012 — with a Tudor teardown quickly replaced by a “Tudor-inspired” mansion with double the square footage — went for $7.96 million two years later. And sales are far from cooling down. In a normal six-month period, 20 to 30 houses sell in Shaughnessy; in the first nine months of 2015, the number was 110. “The market is crazy, crazy nuts,” says Les Twarog, a realtor with Re/Max Crest Westside who has specialized in the area for the last five years. According to Vivian Li, a realtor with Sutton Realty — who sold $120 million worth of property, around 60 per cent of it in Shaughnessy, in the first nine months of 2015 — it’s business owners, often with overseas interests, who are buying in Shaughnessy. Many of those buyers tend to be immigrants, largely from Mainland China, say realtors — although that’s not universally the case. “Newcomers don’t immediately buy a $5-million house,” says Peter Saito of Sutton Realty. The majority of buyers are trading up, he says: having lived in Vancouver for a few years, they or their family are now moving from a $2-million property to a $4-million or $5-million one. And according toBCBusiness’s research, 30 per cent of the homes sold on Angus Drive between 2012 and 2014 were paid all in cash. Regardless of whether they’re wealthy immigrant investors or residents trading up, taking out a mortgage or paying in cash, what they all have in common, say realtors, is that they don’t shop at open houses and they rarely use MLS. The vast majority of sales are generated through referrals: friends, relatives, business partners — and immigration consultants. Indeed, several realtors credit at least half of their business to referrals from immigration consultants. Many of those consultants, based in Vancouver and Toronto, run websites and operate booths at exhibitions in Shanghai and Beijing; along with brokers from Australia, California, New Zealand and Europe, these firms market the Canadian lifestyle (clean air, good schools and a house with a yard) with links to listings. One firm — Can-Reach (Pacific) Consultants, with offices in Richmond — even offers to set up prospective immigrants with a mortgage broker, realtor, lawyer and local furniture store. The steady stream of wealth-based migrants is a replay of the wave of Hong Kong migrants who came in the 1990s, says David Ley, a UBC professor of geography and author of the 2010 book Millionaire Migrants. “The motive of many of Vancouver’s business immigrants then was to get Canadian citizenship, which they regarded as an insurance policy against the mainland’s political interference in Hong Kong and Taiwan,” says Ley. But the level of wealth involved has gotten “a lot deeper” since the 1990s, says Ley, and the process of immigration a lot easier — streamlined by consultants with savvy marketing operations and faster document translation. The addition of consumer-facing operations by Canadian banks in China has also helped. HSBC, historically the bank that bridges Hong Kong and Vancouver, has been joined by Bank of China, Industrial and Commercial Bank of China, the Royal Bank and Bank of Montreal in allowing non-residents to take out mortgages, starting with a 35 per cent down payment. (Some banks even allow buyers, represented by a relative or friend in Canada, to purchase a house without ever setting foot in the country.) As well, getting between Vancouver and China has become much easier and cheaper: in 2000, there were around 10 weekly flights to China; by the summer of 2015, the number was 40. While most of the media attention on the “foreign money” flooding into Vancouver real estate has focused on the negatives, realtors we talked to emphasize the positives — particularly the money injected into the local economy via shops, restaurants or services. These homebuyers, says realtor Saito, “are real people with real families and real needs.” Moreover, some industry observers think the very idea of the “foreign” investor is a red herring in today’s global economy. Thirty per cent, or 12 of the 40 houses surveyed, were all-cash deals. West-side Vancouver realtors say they deal almost exclusively in all-cash transactions. Across the Lower Mainland, 20 per cent of residential properties are purchased in cash, according to the B.C. Real Estate Association–albeit at much lower price points. And according to many industry observers, that percentage of cash transactions tends to decline as you move into more expensive homes–the exact opposite of what’s happened on Angus Drive. 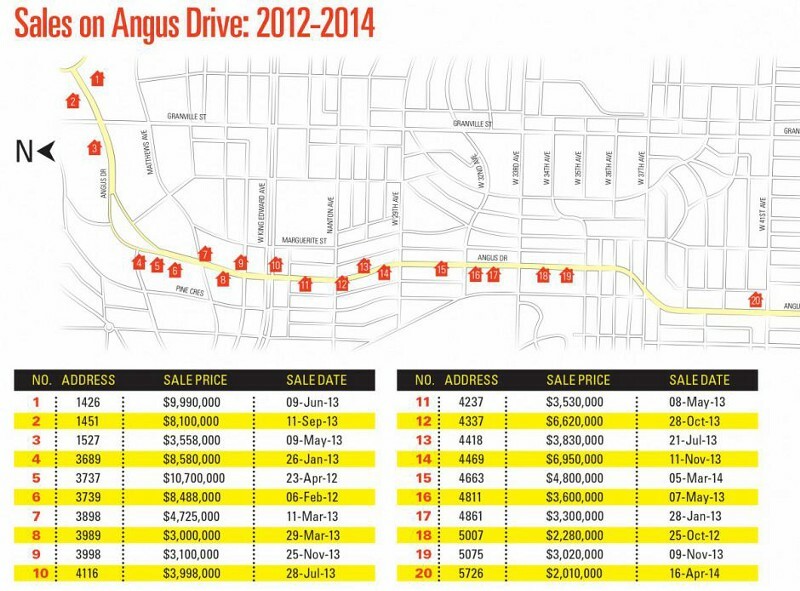 Between 2011 and 2012, property values along Angus north of 33rd Avenue increased 66 per cent; between 57th and 33rd Avenue, 39 per cent; and south of 57th Avenue, 33 per cent. 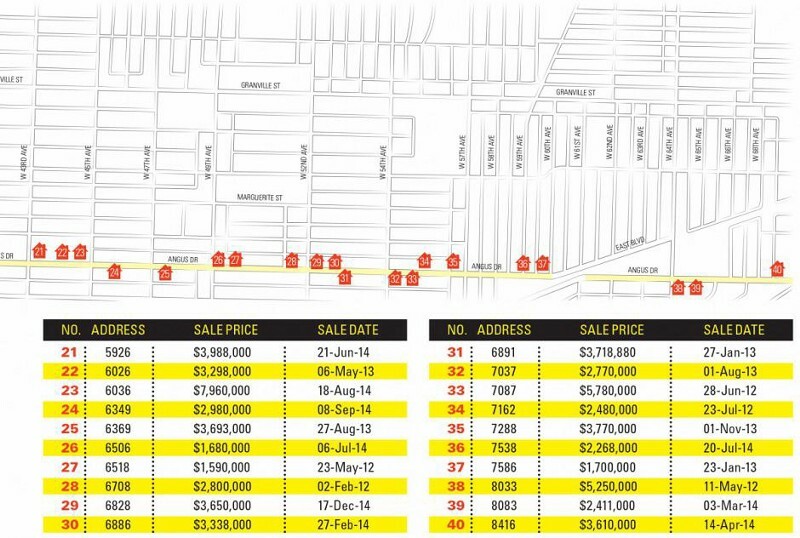 In Toronto’s Lawrence Park, Leaside and Davisville–three neighbourhoods roughly equivalent to the Arbutus Street corridor–it took seven years, not one, to see a similar rise in prices. Of the transactions analyzed, 10 owners listed on the title were identified as homemakers, 15 as businessmen and 16 were a combination of the two; two were students, two were doctors (surgeon, hematologist), one was a media agent, while one property was owned by a numbered company registered at the same address as an immigration lawyer. “The role of ‘unconventional buyers’– housewives, students and self-employed–is notable,” says UBC’s David Ley. In 30 per cent of the homes surveyed, the city of Vancouver issued a development permit within two years after the sale. In three cases, a development permit was issued within two years before the sale–a sign, says realtor Les Twarog, that the owner intended to sell. Since September 2015, new City of Vancouver rules prohibit the destruction of prewar houses, which Twarog expects to have a marginal negative impact on sale prices.